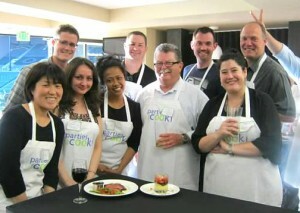 As the newest marketing intern at Parties That Cook, I recently experienced my first PTC event: The Kitchen Challenge. 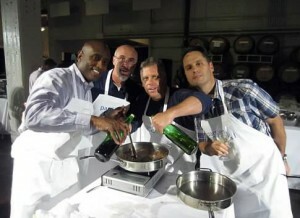 This intense Iron Chef-style cooking competition took place at an urban winery in our very own Dogpatch neighborhood of San Francisco. Upon entering Dogpatch Wine Works, I noticed how large and spacious the winery was. High ceilings and wooden wine barrels enhanced the authentic winery look. I helped our chefs and staff set up before the guests arrived, and I was surprised to see everything being prepped in such a neat and organized fashion. For this team building event, the wine tasting room and bar area were set up with a few dining tables on one side, nicely decorated with flower arrangements, elegant napkins and silverware. The “kitchen” on the other side had ample supplies for the cook-off, including mini ovens, toasters, fresh food, condiments and spices galore. Talk about a mobile kitchen! Nearing the start of the evening’s event, our guests began to arrive. We greeted them with a Parties That Cook apron, and they all seemed to light up as they glanced around the room. 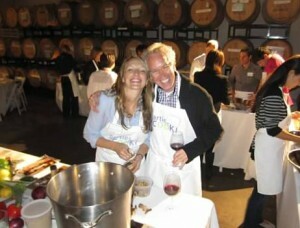 Awaiting the cooking demonstration, guests mingled, chatted and laughed with their colleagues while sipping an assortment of red and white wine. It was clear everyone enjoyed this break from work, as relaxed music played, and platters of delicious cheese and crackers were devoured. The ambiance was great; you could feel the positive energy throughout. Executive Chef Tanya Rogow introduced the guests to rules of the challenge and provided some helpful do’s and don’ts while in the kitchen. It was nice to see this hardworking group unleash their inner child, cracking jokes about themselves and one another. Once the teams were formed, and the high fives and hollering began, the group was off to the kitchen! In this hour-long timed challenge, each team creates an entire meal from scratch. They must use the provided secret ingredients, including one specific protein, starch and vegetable. Ingredients included purple and white cauliflower, chicken, potatoes and rice. 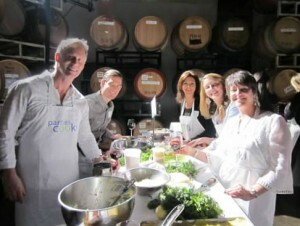 Each team was assigned their own Sous Chef to encourage creativity and guide the group throughout the no-recipe cooking process. With an array of spices and ingredients available, everyone was able to draw from their individual pallet and work together to create a unique masterpiece! There was constant chatter and buzz as teammates provided input on what they thought would give their dish pizzazz! 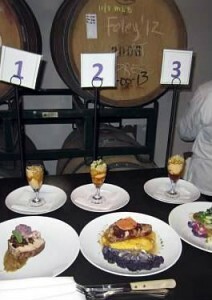 With time winding down, teams worked under pressure to finish their dishes. Though some teams were definitely feeling the heat, there was a surprisingly lighthearted atmosphere. Then, it came time for deliberation by the judges. 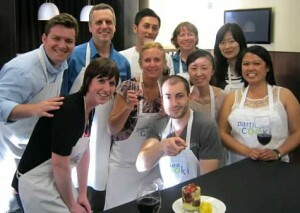 Regardless of which dish won, each team was proud of their dish as everyone sampled their fellow teammate’s concoctions. It then came time for everyone to sit down and enjoy their “fruits” of labor and teamwork, all served up in nice white dinnerware. From the appetizers, a delicious self-made meal and dessert, the night was a great example of teamwork served up in a tasty manner! It’s been a while since we heard from our Portland team, so let’s check in with them, shall we? There’s been a flurry of exciting activity up there, but luckily Carolyn was able to give us the scoop on a recent Kitchen Challenge! As you may recall from the blog a couple weeks ago, the Parties That Cook Kitchen Challenge is a distinctive mix of The Apprentice and Iron Chef. Fast-paced and competitive, the event never fails to get the creative juices flowing while bringing out the fun inner chefs of our guests. Our latest international corporate group from Nike was no exception! In Portland, there’s no better place to host a Kitchen Challenge than at one of our favorite venues, Jeld-Wen Field, home of the MLS Portland Timbers Soccer Team. You can’t escape the competitive spirit! Before revealing the secret protein, starch and vegetable, Portland Lead Chef Laura began this cooking competition by presenting entertaining cooking tips and tricks. Teams would be working with flank steak, orzo pasta, and green beans. Preparation, techniques, and additional ingredients would be up to the team members. As usual, the only recipe we provided was for dessert: Boston Cream Pie Trifle with Strawberries. Yum! As Laura counted down to the start of the timed hour of cooking, anticipation built, and then the hustle and bustle began! Both teams came up with dishes that represented its members – one team had an Asian influence from four of their teammates, and the other team added an Italian flair to their orzo pasta by making it orzo “risotto”. All the food was very creative and delicious! Ruby, our Nike host, graciously told Laura that the Kitchen Challenge was “fun and engaging because it offered both structure and the opportunity to think creatively and play.” High compliments indeed! Seeing as the food was delicious and the guests had a marvelous time, I’d say our PDX team scored a perfect 10 on providing the framework for another great event. Good job team!